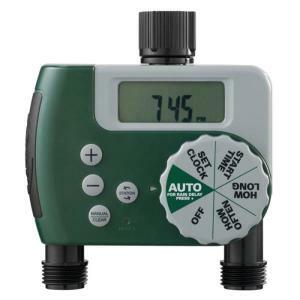 This very economical, easy to program digital water timer has two independent watering outlets. The large digital screen and dial make programming a breeze. No more forgetting to water your plants, or worse yet, forgetting to turn the water off. Just program to your plants needs and this durable, weather resistant timer will do the rest, keeping your plants healthy and happy. This timer requires a minimum of 5 PSI to open/close the valve and a minimum flow of 2.7 GPM (gallons per minute) translating to 162 GPH (gallons per hour).